MiniShare is an ultra-light, lightning fast, file-sharing application that enables users to transfer content seamlessly between devices. The app prides itself on being small, or in other words less than 2MB, making it easy for users whose phones have limited storage to have access to our services. 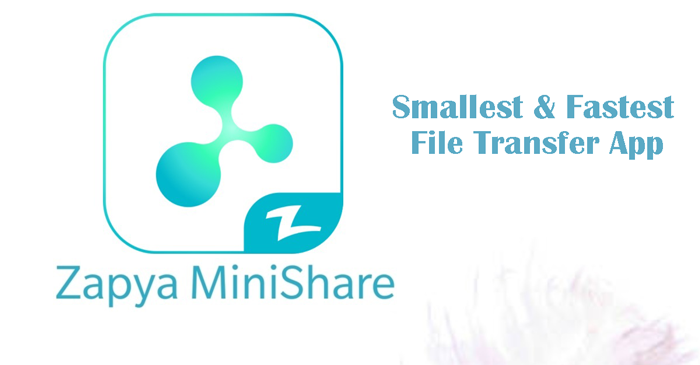 “Zapya MiniShare” is smallest file sharing app with less than 2MB. Minishare app is best solution for fast file transfer from one device to another. If you are using smartphone with low memory and unable to install Zapya then Zapya Minishare is best option. You can share files, apps, photos, videos and other files instantly with others using Minishare. How to Use Zapya MiniShare? Select Send or Receive option to from home screen. Select file, app, videos you would like to share. Tap on Send button at the bottom. You can locate the other device by using the device or scanning the QR Code. Simple answer is that Zapya MiniShare is smallest and fastest file sharing app. You can transfer files from Zapya minishare to any Zapya user. Both Zapya and Zapya minishare users can connect and transfer files. Whereas, You can also use webshare feature within Zapya minishare app and can transfer files from smartphone to PC and back. Minishare is small but a perfect pack of features for a file transfer app. However, some of prominent features include following. Minishare allows users to create group and share with more than two users on different devices. Minishare is only 1.8 Megabytes! you can download instantly and start transferring your files. If you have no WiFi connection no need to worry. Now Minishare works without WiFi connection. The app does not run as a background application, thereby consuming less memory on your smartphone device. Now you can share large files and these large files can be shared by creating local connection with other devices. However, You just scan QR code and rest will be done by Minishare. QR code is easiest way to connect with other devices so connect minishare using QR conde and you are ready to share. The application is also fully compatible with Zapya – File Transfer, Sharing on Android, iOS, PC and Mac platforms.